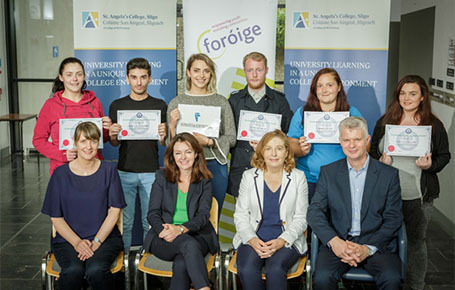 Pictured are a group of Foroige members (of the Youth Employability Support South Sligo Group) who were recently awarded Primary Food Hygiene Certificates accredited by the Environmental Health Officers Association in St. Angela’s College. Certificate recipients are able to work in the catering, retail, food service and food industry sectors. The course was delivered by Michael Hosey of St. Angela’s College Food Technology Centre. Ms. Dorothy Clarke, International Fund for Ireland said that these young people deserve credit for the achievements they have made through this Youth Employability Support South Sligo (YESS) project. The International Fund for Ireland awarded support for the YESS project from its Personal Youth Development Programme, a programme which helps participant become more employable. Ms. Deirdre Gallagher Co-ordinator of the YESS project said that “this project is about equipping these young people with the knowledge, skills and competencies to build a more positive future for themselves and others and hopes to expand this programme in the South Sligo area in the next two years”. Back row: (l-r) Amy O’Hara, Edward Keane, Jacqueline Barrett, Patrick Skeffington, Shannon McCann, Chantelle Kane-Clarke.